Scubacraft Just As Happy Under The Water As On | OhGizmo! If you’ve got an extra $164,000 laying around, and a sense of adventure, you might want to get your name on the waiting list for the Scubacraft. It’s essentially a speedboat with a specially designed trimaran hull that makes it just as comfortable on the water as it is under. And while technically you could refer to it as a submarine, it can only dive to depths of about 100 feet, and you’ll need to bring your own SCUBA gear since it doesn’t have an enclosed cabin. But thanks to a high-powered jet propulsion system you’ll be able to zip along under the waves or on top of them, depending on your mood, or escape plan. 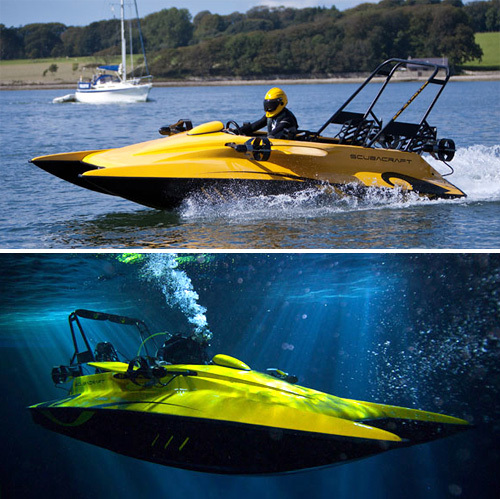 Orders for the Scubacraft are currently being taken, and delivery is expected somewhere near the end of 2010. Yes, but can it fly? They couldn't make a small airtight dome over the cockpit? Who wants to pay out a bazillion dollars and then have to wear scuba gear? What first attracted me to scuba diving was how relaxing and free you are underwater. This seems to kill that a bit. At least you'll look really cool. It seems like it would be something that would be fun the first couple times, then quickly go to being stored in the back of a shed. However, it seems as though it might have some potential in science, maybe. Anybody remember Spykids? The first one was great, especially the scene with them in a submarboat (?). That was the first thought when I saw this, although they had an enclosed cockpit. YES. This is what being rich is all about. For those who can't see the utility, consider first of all that you can use it to enter/exit your secret lair via the underwater tunnel. Moreover, you can host your own underwater safari by running down and speargunning large fish and water beasts. Oh, did that thousand pound sturgeon snap the line and run off? Don't sit there sniveling, man the Scubacraft! We're going after him! soon someone will make one of these with the scooba gear built in with a cockpit dome. enter the boat submarine. Only 100 feet? Thats deep as hell! If this thing won't get you laid then you should turn in your man card. What kind of power source does it have? It has to be electric or something since you cant run a engine without air to burn. They need to re-edit their demo video: It's primarily a surface craft that transitions to a subsurface one, so the video needs to start with surface activity AND THEN show it diving into the inky depths. The way they have it just gives me a headache, because everything's out of sequence. Is $164,000 the base price? Can I pay extra to fire torpedoes from this bad-boy? I have seen these over the years and they never seem to catch on. I think it would be sweet. As other posters have said you would think that for that price you would not need scuba gear.